"Their priority is profit," Assemblyman Jerry Hill said. "Their priority should be safety." 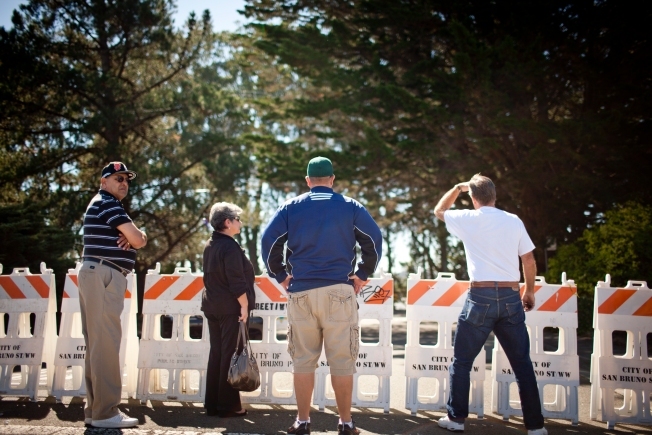 Residents try to assess the damage after an explosion September 10, 2010 in San Bruno. Much of the neighborhood remains the same two years later. Almost two years after a gas transmission pipeline exploded in San Bruno, homes that were destroyed are slowly being rebuilt, and the community continues to push for stricter safety regulations in the gas industry to prevent a similar tragedy from happening again. Assemblyman Jerry Hill, whose district includes San Bruno, held a news conference this morning in the Crestmoor Canyon neighborhood just feet from where the 30-inch gas line ruptured and exploded on Sept. 9, 2010, killing eight people and destroying 38 homes. Eight homes have already been rebuilt and more than a dozen others are in the planning stages, Hill said, though residents continue to struggle with the memory of what happened in the neighborhood. "We will never forget what happened to our community and our neighbors," he said. Resident Bill Magoolaghan, whose home was severely damaged in the fire, said he thought PG&E has made some positive changes with regards to safety standards and natural gas operations in the two years since the explosion, but that more changes would be needed to guarantee that a similar disaster doesn't happen in another community. "I think they're moving in the right direction, but they've lost their way before," he said. Hill accused PG&E of neglecting its infrastructure and allowing a corporate culture of profit making to take precedence over safety. "Their priority is profit," Hill said. "Their priority should be safety." Hill has proposed a series of bills that attempt to make changes to the way PG&E does business, like requiring the California Public Utilities Commission to adopt new performance metrics for pipeline safety and levy fines for violations. Hill said that PG&E has "resisted change" and used its influence in the state legislature to defeat or water down new safety legislation. San Bruno Mayor Jim Ruane said that a day doesn't pass that he doesn't think about the fatal explosion of two years ago, and that the effort to create changes in the natural gas industry and at PG&E needs to press forward. "This happened in San Bruno, but it could have happened anywhere," Ruane said. "What happened here could have been prevented," he said. A remembrance event marking the two-year anniversary of the disaster is planned for Sunday at 5 p.m. at San Bruno City Park on Crystal Springs Road.